That old rubber hose, it ain't what it used to be. Today's aggressive fuel additives have greatly shortened the life span of traditional rubber-based hoses. The performance and racing fuel-hose market is on the verge of its biggest transformation in the last 50 years. 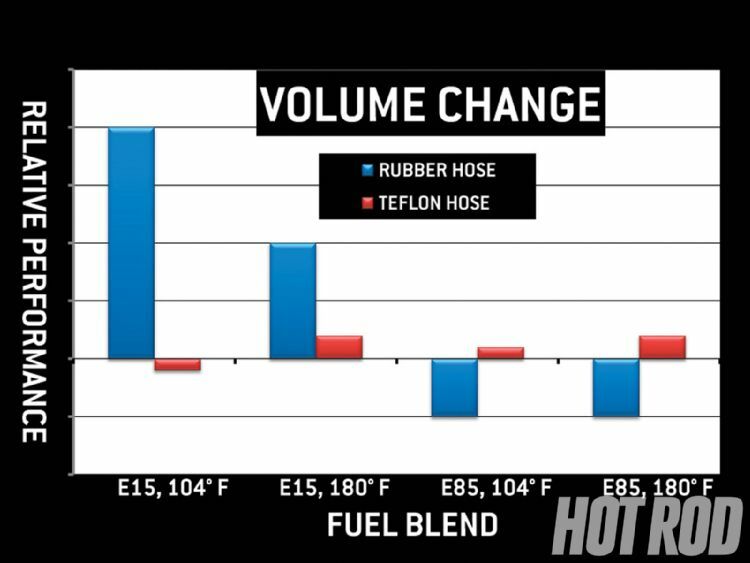 Ever since the '60s, when aircraft-derived, rubber-core, stainless steel-braided hose and the familiar red-and-blue aluminum fittings began to replace parts store black rubber hose and worm-drive clamps as the performance and racing fuel hose of choice, the hot rod fuel-hose market has been relatively stable. 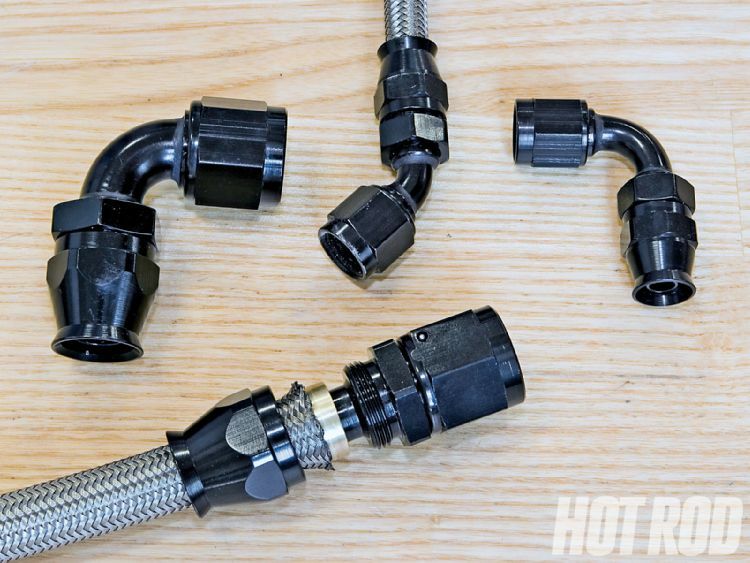 True, the hose and fittings have evolved incrementally, with different manufacturers featuring their own pet design innovations, but until recently, the basic appearance and system functionality have stayed pretty much the same. And now that's become a problem: Similar to the flat-tappet cam failure problem HOT ROD reported on a few years back, a perfect storm of diverse factors have combined that under certain conditions may seriously degrade the reliability and safety of traditional rubber-based hose formulations when used over extended time periods. 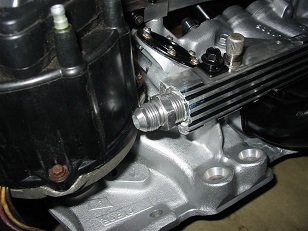 Cooler fuel , and air,tends to help reduce an engines tendency to detonate , a return style fuel pressure regulator and some thought put into routing your fuel lines away from obvious heat sources like headers will help reduce the fuel pressure and avoid problems like vapor lock ,or hard starting in hot weather. These Aeroquip Performance hoses represent the traditional hot rod hoses we've always used. 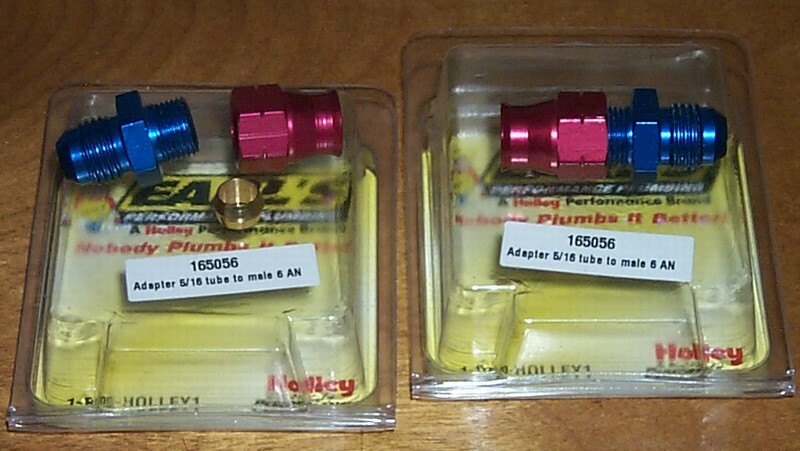 From top: AQP-core, stainless braided racing hose with new black or classic red and blue hose ends; budget Socketless, AQP-core, textile-braid racing hose (both the black and blue hoses); and Teflon race hose with steel fittings, durable with a high pressure rating but stiff with a large bend radius. 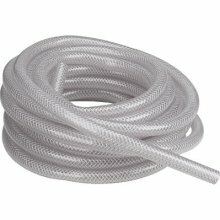 Developed in the early '50s for military aircraft, stainless steel-braided, chlorinated polyethylene (CPE) hose was designed to be reasonably compatible with a wide array of aircraft fluids, with fittings that could be installed using simple handtools. 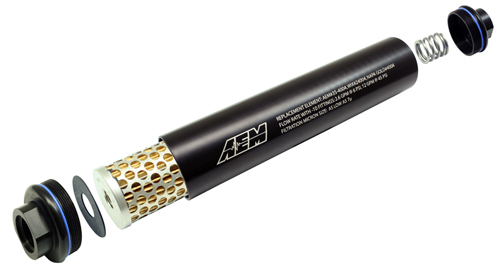 Descendents of it still constitute the mainstream of today's racing hose market, with slight manufacturer-specific compound variations (Aeroquip, for example, calls its CPE compound "AQP"). Even for aircraft, the specific hose compound was always a compromise-so it always degrades over time. For aviation, that's OK because the hose is always replaced after a prescribed interval before any serious harm can occur. But this also means that-even in the heyday of high-octane, leaded gas-CPE-based aircraft-style hose was never ideal for long-term, indefinite, highway use. If until recently it seemed to outperform parts store black hose even on a daily street driver, it was primarily due to high-quality, aerospace-type manufacturing techniques, the stainless braid's higher temperature resistance, and drastically lower operating pressures compared with the original aircraft applications (for example, up to 1,000 psi on an aircraft in the -6 or -8 hose sizes, compared with less than 100 psi even on an automotive fuel-injection application). But in the last decade, things started going downhill. Fuel chemistry has changed radically since the original hose was developed to resist high-octane aviation gas and jet fuels. Street gas was reformulated with weird additives and oxygenates. Reformulated gas can have up to 15 percent ethanol, and E85 (about 85 percent ethanol) is common in the Midwest. 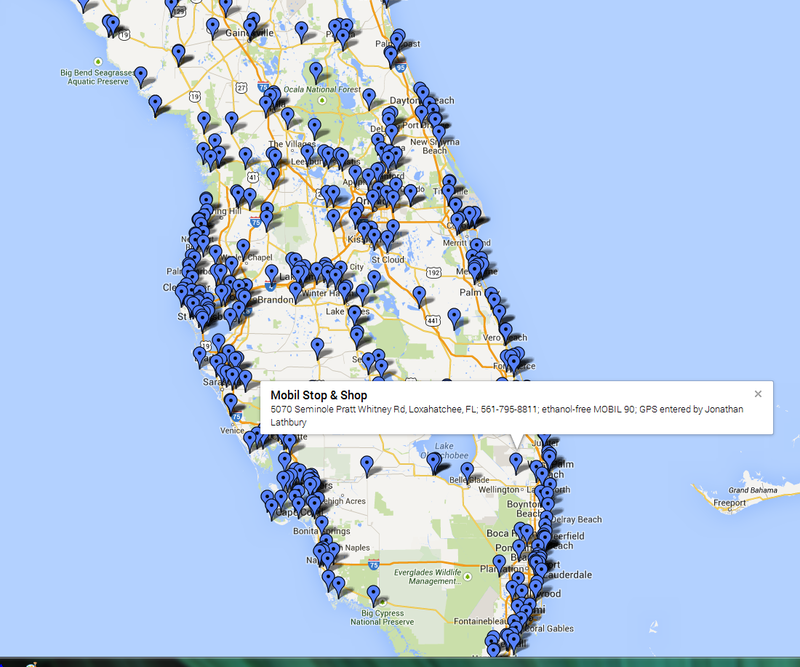 It's gotten to the point where there's at least 23 different regional street gas blends. The brew can also vary seasonally, and not every state imposes strict quality controls in the first place. Some blends have caused minimal problems, but others-particularly those with ethanol and other abrasive additives-cause drastic rubber compound degradation. New-gen, ultralightweight, flexible PTFE (Teflon) hose is now the first choice of top-tier racers. Brown & Miller hoses currently dominate NASCAR racing and many other pro racing series. Here, its hose was used to plumb a Sprint Car's fuel cell. Although not as bad as street gas, many leaded, competition-only gas blends now have aggressive additives, that-while still allowing the blend to pass a sanctioning body's fuel check-are almost as caustic as alcohol fuels. Whether with street or race gas, deterioration is accelerated when the car sits for a length of time. Some experts recommend purging the system, while others caution that the hose may dry rot if it doesn't remain wet. Knowing what to do is a real crapshoot. Definitely don't expect that bulk rubber-core racing hose bought years ago to still be viable even if it has just been sitting in storage. All rubber-based hose has a finite shelf life. 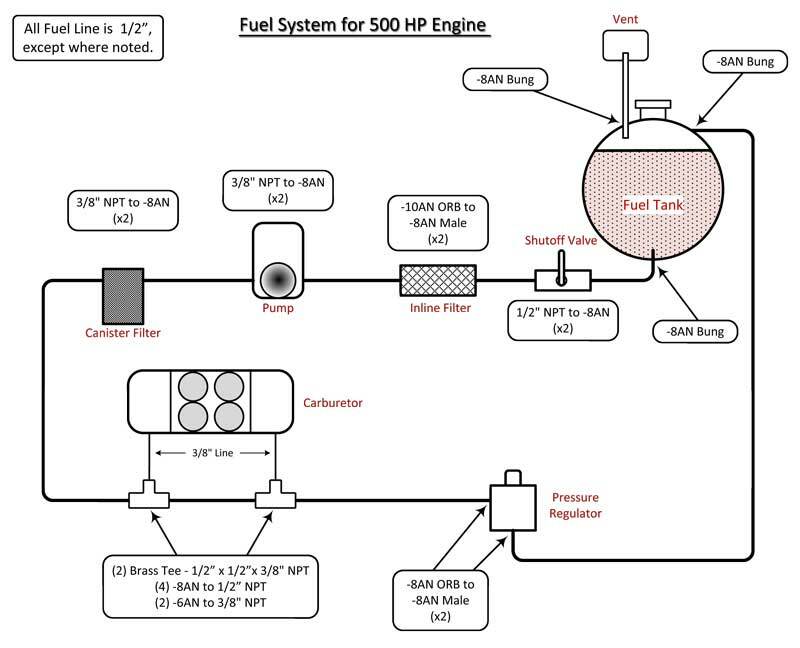 Electronic fuel injection systems introduced yet more issues. Compared with carbureted systems, high-volume recirculation fuel injection setups have a serious effect on rubber-core hose due to the much greater amount of surface footage and volumes of fuel passing through them. Fuel returning to the tank on a recirculation-type system gets aerated, souring the gas and accelerating hose degradation because of increased oxidation and leaching of the tube elastomer. 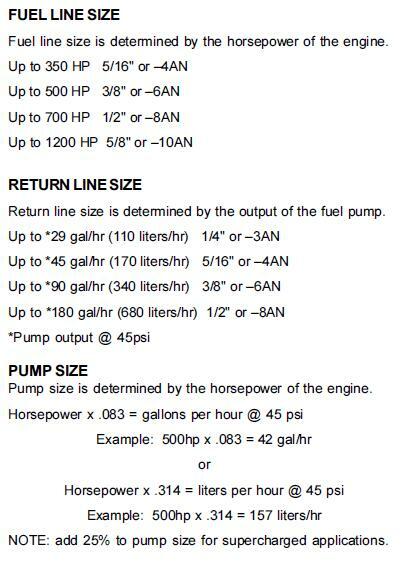 Additionally, more heat is transferred into the gas tank by fuel returning from the engine compartment, heating the fuel overall and further accelerating hose degradation. Today's engine compartments are also much hotter-at times approaching 400 degrees F-which impacts underhood hose big time. And fuel injection nozzles are easily clogged by rubber particles breaking loose from hose deteriorating on the inside. 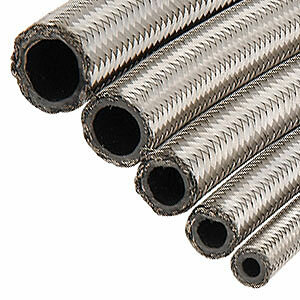 Reusable, lightweight, aluminum fittings are becoming available for PTFE hose. 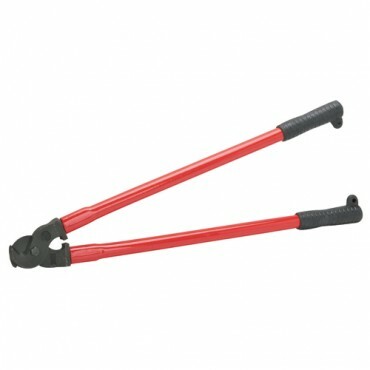 These are Bonaco's rendition, which appear very similar to the traditional red-and-blue fittings we have always used. Pricing on smooth-bore, stainless-braid, PTFE hose has come way down. If reformulated fuel weren't bad enough, inferior Chinese hose and fittings have seriously contaminated the supply chain. 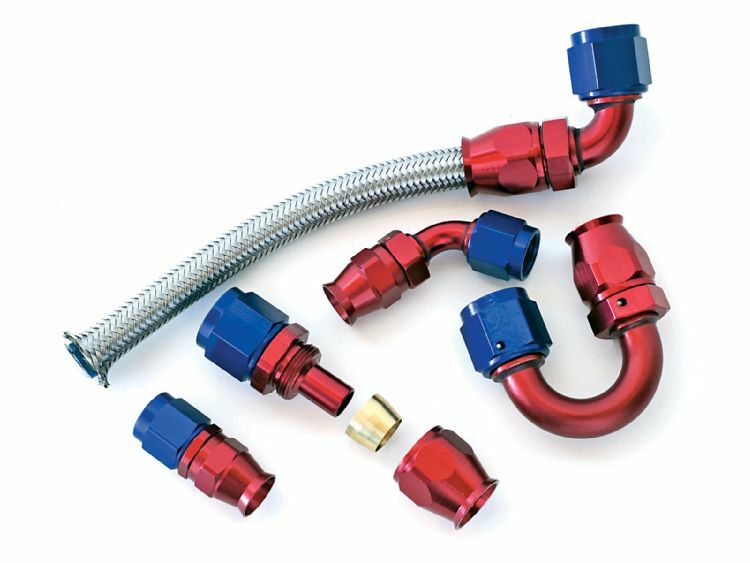 These hoses and fittings may look like the real McCoy, but the hose compound may be the wrong formulation, the braid may not be correctly bonded or extruded through the rubber, the hose bore may not be concentric (causing eventual leakage or failure at the fittings), and the fittings themselves may be made from inferior alloys or have the wrong heat treat. There's no easy way to tell by looking at the outside. All we can say here is buy name brand parts from a reputable manufacturer or distributor. One workaround is to inspect and replace rubber hoses in a timely manner, just like aircraft mechanics have always done. Savvy racers have known this for years, but on the street, the usual approach is to only replace on failure. That's not too big a deal with a generic parts store hose, but it's aggravating when it's a trick hose with expensive fittings. Still, if you are going to continue using CPE- or nitrile-based hoses, proactive maintenance needs to become as routine as an oil or fan belt change. Hose makers we talked to were reluctant to recommend a specific replacement interval, but empirical field experience suggests this may have to be done every 12 to 18 months. The ideal solution would be to just say no to traditional rubber-core hose-assuming there are better hoses available for substitution. Fortunately, modern technology has provided both low- and high-end alternatives. A new player in the lightweight hose market, TechAFX sells the same PTFE-core, stainless-braid hose used on new GM cars, but unlike the General it has both OE-style quick-disconnects and a large variety of field-installable, black-anodized, aluminum hose ends. So far, TechAFX hose is offered in -6 (3/8), -8 (1/2), or -10 (5/8) sizes; hose and hose-end pricing is within 10 percent of stainless/CPE-core hose. If you just want reasonable longevity at a modest cost without regard to appearance, the budget, parts store solution is hose meeting SAE standard J30R9 or (just becoming available) the further improved J30R12. Although these hoses can operate at up to 180 psi, what really makes them better than generic parts store hoses are the improved materials they're made from, designed for contact with alcohols, diesel, oxygenate additives, and oxidized gas. Although the outer walls are usually still hydrogenated nitrile butadiene rubber (HNBR) or CPE, internally there's a thin fluoroelastomer, FKM, or Viton core. Collectively, the design also resists cracking caused by sour gas and reduces emissions because fuel can't evaporate through the hose. XRP is said to be working on a braided racing hose conforming to SAE J30R9 that may eventually replace traditional CPE-cored formulations. 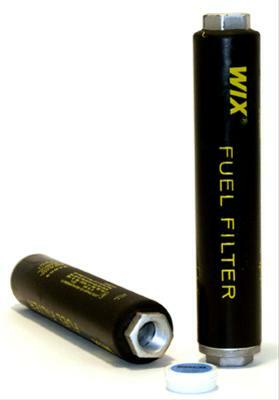 This would offer significantly improved durability but still keep down the price of race hose. We'll keep you updated on XRP's progress. 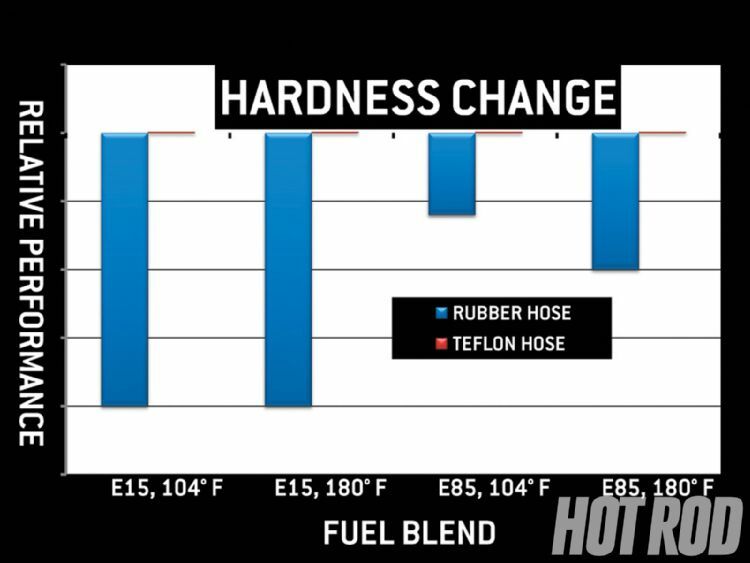 While J30R9 is better than old-school fuel hose, like any rubber-based hose, it, too, eventually deteriorates. In fact, domestic OE new-car manufacturers have pretty much switched to Teflon-based hoses. We may call it Teflon, but that's actually DuPont's trade name for polytetrafluorethylene (PTFE), a synthetic fluoropolymer that is stable at very low and high temperatures and chemically inert to everything except acid. PTFE hose is so durable that, absent crash damage and assuming proper installation practices, it should outlast the life of the car. These Orme Brothers hoses illustrate today's wide variety of hose choices. From bottom: Stiff, high-pressure PTFE hydraulic hose; Brown & Miller flexible, lightweight, convoluted PTFE hose with black polymer braid, green/blue fire-retardant Nomex braid, or (in two different sizes) black/blue polyester cover; and XRP flexible PTFE dark gray/yellow Kevlar that's uniquely smooth on the inside but convoluted on the outside. 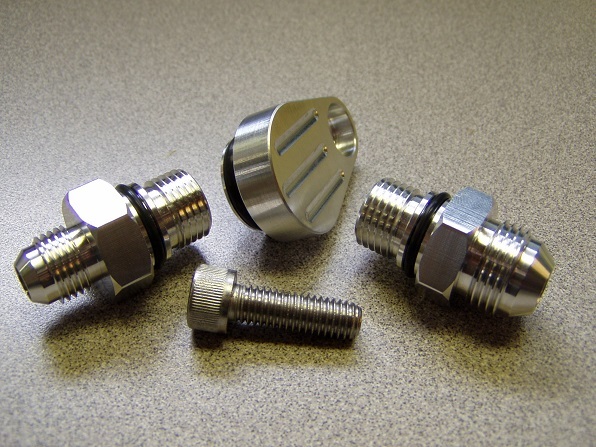 Swivel-after-assembly elbow (arrow) eases double-elbow installations. About the same time the aerospace industry developed medium-pressure, rubber-cored hose, it began PTFE hose development for high-pressure, hydraulic-impulse systems that by the late '50s were pushing 3,000 psi. PTFE hose eventually found its way into racing applications, primarily for brakes, hydraulic clutches, and power steering systems. 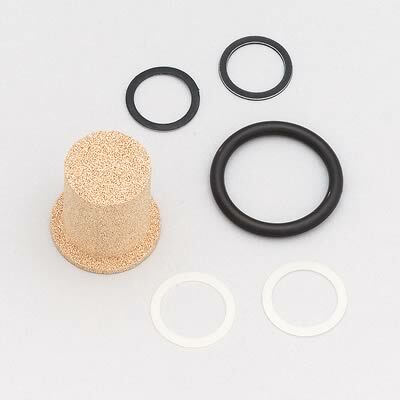 Originally, PTFE was much costlier than CPE. It was also very stiff, with a bend radius at least twice that of CPE-based stainless braided hose. 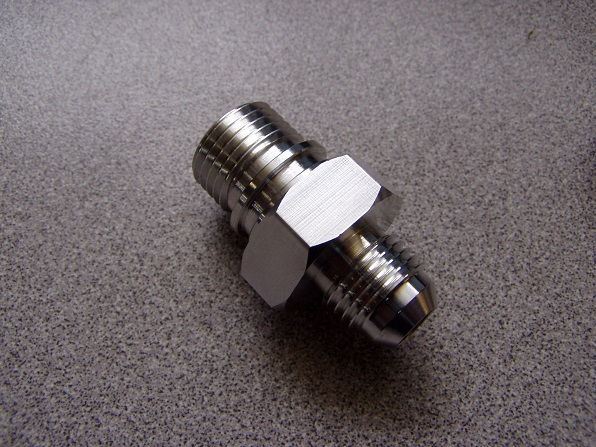 The available mild steel or stainless steel PTFE-compatible hose ends were heavy and bulky in the larger dash sizes typically used for fuel systems, with only a limited selection of elbow angles available. More recently, Earl's, Goodridge, TechAFX, and others introduced a wider variety of fittings in aluminum, but that still didn't solve the bend radius or cost problems. Professional racers then did the OEs one better, adding extreme light weight to their list of desired hose attributes. A stainless outer braid may have been a lightweight answer in the context of the '60s, but polyester, synthetic polymer, Kevlar, and other exotic new materials can save even more weight while still providing adequate abrasion protection and (with Kevlar) high-heat resistance on a par with stainless steel. Pioneers in the racing market such as Brown & Miller, Goodridge, XRP, and Earl's have also introduced ultralight PTFE hose that's now a must-have item for high-end racers. Meanwhile, Aeroquip says it has several programs in the works to address this emerging market; expect to see some new hose designs later this year. Depending on the specific exotic-outside-braid material used, ultralight, exotic-braid, PTFE hose may be anywhere from 3 to 15 times the cost of traditional CPE-based hose. 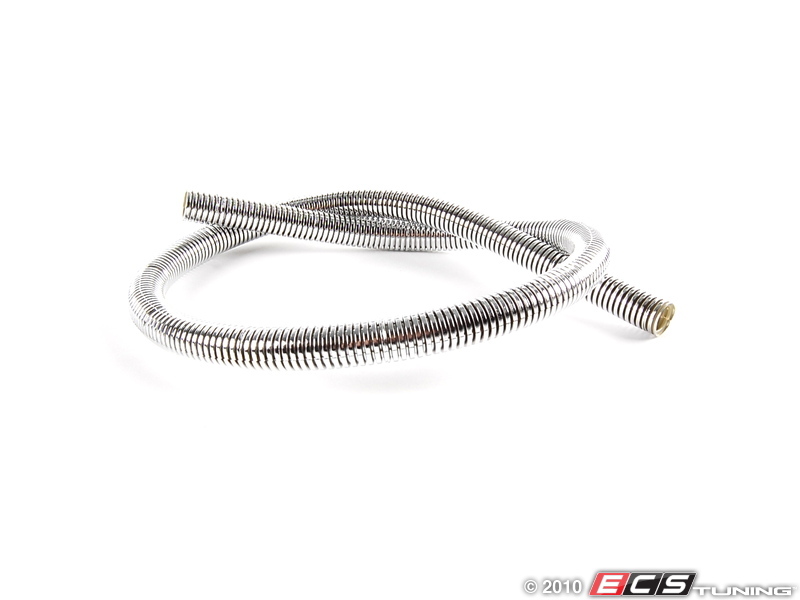 But thanks to the big OE production volume, the cost of reasonably tight-bend-radius PTFE fuel hose with stainless braid is way down, often within 10 to 20 percent of CPE racing hose if you shop around. There are even some places selling the older, stiff, high-pressure/large-bend-radius PTFE hose for the same or lower price than CPE racing hose. And considering its unlimited life span, PTFE's actual life cycle cost is much cheaper in the long run. 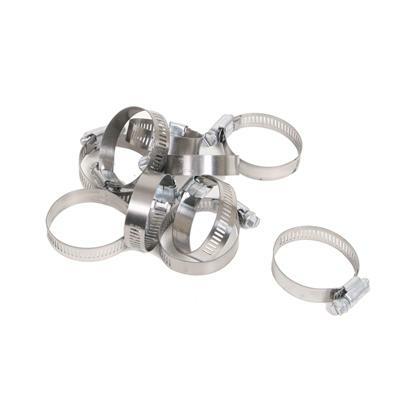 Available for both hose and rigid tubing, clamshell-style quick-disconnect couplings like this one from XRP are increasingly popular in the racing world. They snap together with no tools. 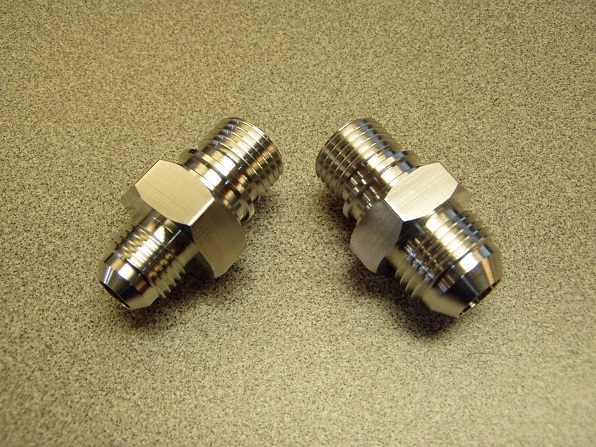 Even when joining two lengths of rigid tubing, the clamshells offer excellent flexibility with up to 1/4 inch axial adjustment and Â±4 degrees of angular misalignment. 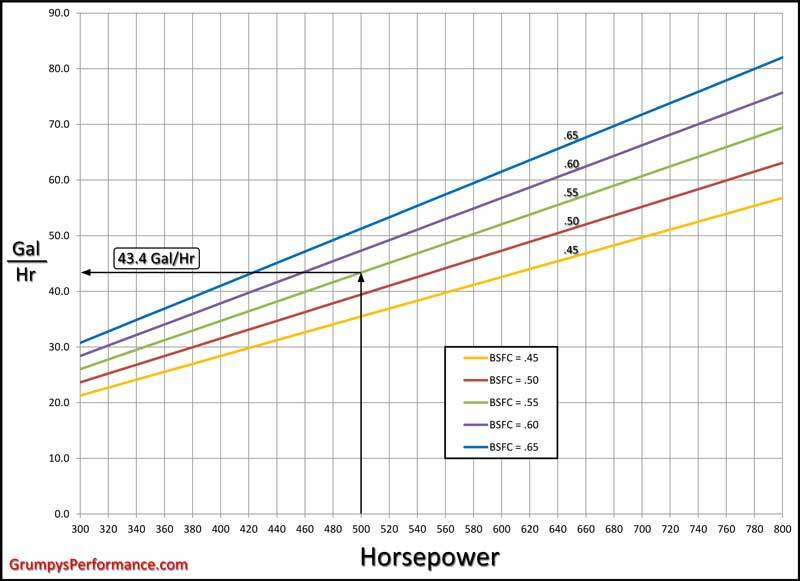 Smooth-bore adherents claim that fuel flow is slightly higher compared with convoluted hose, but Brown & Miller's Martin Clark counters that fuel flow in convoluted hoses does not encounter problems until fuel velocity exceeds about 70 gpm (gallons/minute)-that's Top Fuel territory. It is this writer's opinion that some PTFE-based hose variation will increasingly become the performance hose of choice for all hydraulic, fuel, and even oil systems. PTFE prices will continue to drop, fitting variations will proliferate as they did with traditional CPE hose, and eventually nearly all of us will use PTFE hose for just about every application from grocery-getters to race cars. Next time your rubber-core hose gives out, why not upgrade to PTFE? It'll be the last hose you ever install. 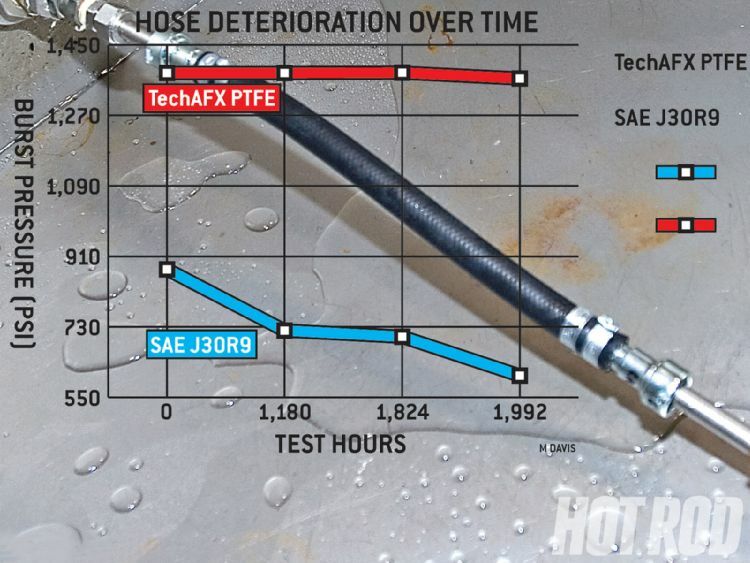 SAE J30R9 or J30R12 hose may be the most compatible rubber-based hose formulations out there for today's street gas, but they still can't hold a candle to PTFE hose. TechAFX is a business partner with and performance outlet for StanPro/Cooper Standard's engineered PTFE hose assemblies; it asked StanPro to utilize its TS969 ISO-certified lab for comparing the hose compounds' performance using the industry-standard SAE J2260 aging/temperature-soak tests running industry-standard "Fuel C" (a nonexplosive fuel mixed with methanol that safely replicates today's gas). 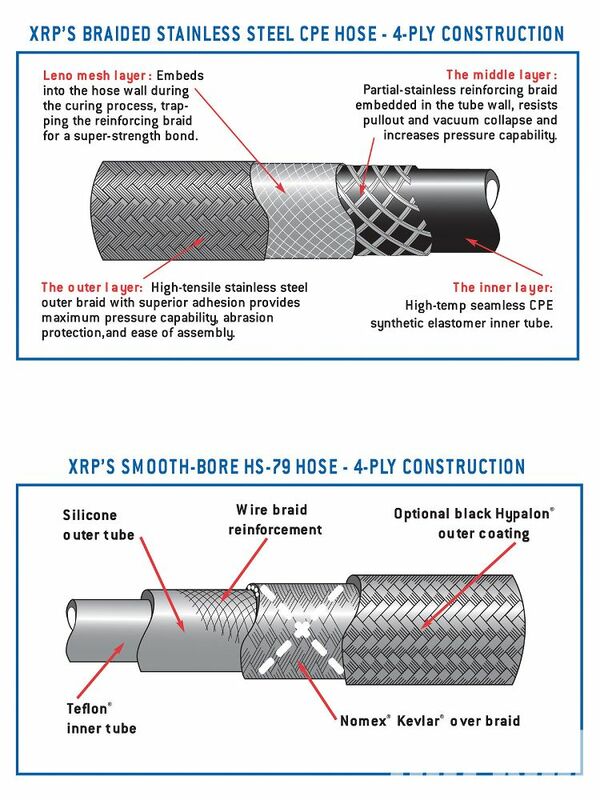 These cutaways show the material differences between CPE-core/stainless-braided racing hose; standard, high-pressure, stiff, stainless steel-braid PTFE hydraulic hose; and examples of new high-end PTFE-core fuel hoses: XRP's HS-79 PTFE-core fuel hose with extra layers of silicone, Nomex/Kevlar, and optional Hypalon outer coating. While the CPE and PTFE hydraulic hoses have higher pressure ratings, for pro fuel system use, the HS-79 outclasses them in every other respect. The figures below are for the -6 (3/8-inch) size. In the automotive world, hose size is expressed by inside diameter. 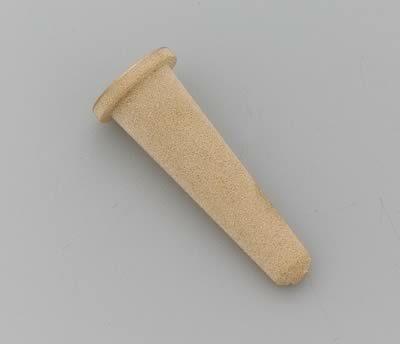 For example, a 3/8 inch has has a nominal (approximate) inside diameter (ID) of 3/8 inch. Not so with aircraft hose. 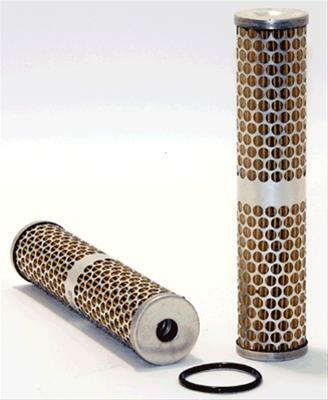 Aircraft hose uses dash numbers to designate the hose size. -8 (8/16) 1/2 inch and so on. But be careful, this does not mean that a -6 hose has an inside diameter of 3/8 inch. 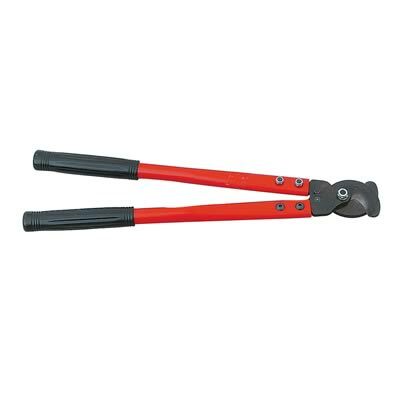 In fact, it can be anywhere from .298 to .359 inch, depending upon the hose type. AN fittings use a 37* flare. A brake line flare tool usually only makes 45* flares. heres some short videos on making braided fuel lines,but let me point out that the pros at most hydraulic supply stores can custom make your professionally assembled hoses for not much more that the cost of the hose and fittings if you know the exact length and type of fittings and sizes you need, in fact in many cases they charge almost nothing for assembly if you buy several custom fuel, transmission coolant or oil cooler lines. my local hydraulic supply also sells the lines fittings, different hoses and tools you might need if you care to do it yourself, and if your just using fuel line its generally far less expensive, to purchase fuel and hydraulic lines there than at the local auto parts stores. using a hammer and chisel , or hacksaw on fuel line is NOT the correct route! On a related note; In the mid seventies I had a '64 LeMans with a 326/4 speed and 389 GTO heads, cam and Tri-Power. I go to a little Harley shop and buy some clear "gas line" thinking that would look cool. Ran it to all three carbs from an aftermarket fuel block. Man that blue Sunoco looked cool going through there! A few days later my boss used it to go to the store a mile or so away from the body shop. I heard the fire alarm going off and didn't think much about it until the phone rang and it was him. He said he was driving down the road when the hood paint started bubbling, he stopped and smoke and flame was everywhere! I was able to salvage a lot of parts including the semi melted battery and intake and carbs. But I lost a really clean LeMans. As a side note this car was navy blue with red interior and as strange as it sounds, looked great! 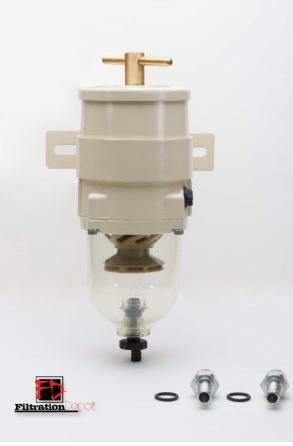 it looks like it works great at first on carb systems with low pressure fuel lines ,but a combo of engine heat and fuel slowly degrades the tubing, it gets stiff and brittle and frequently cracks causing fires, its never designed for use as fuel line or engine heat, its cheap but its not safe! yes we almost all used it back in the 1960s, and many guys had fires as a result, so no one I know would think of using it any longer. Ive seen lots of guys use aluminum fuel line, but Ive also seen several failures , aluminum is not nearly as resistant to wear and vibration damage as steel nor as flexible and easy to used as the stainless braid covered synthetic fuel line, with the crimped on AN style fittings that many hydraulic supply shops can fabricate to your exact specifications. IF YOU PREFER HARD LINES I,D SUGGEST USING STEEL OR STAINLESS STEEL FUEL LINES OF THE APPROPRIATE DIAMETER. and I label the diagram and make a list showing what each section length and the type of connectors to be used, I walk in, and with in 30-45 minutes walk out with every custom section I need the custom fabricated flex hose with ends and made from hydraulic hose compatible with fuel, with stainless braid outer covering that will handle 300 psi and 300F temps with no problem. I learned a hard one! 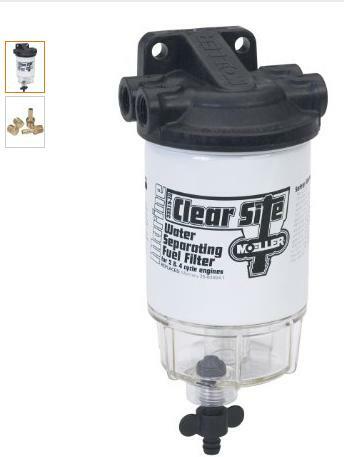 I was just talking with a neighbor who used that reinforced clear plastic fuel line on his car back in the 1980s, it was on a mustang, he owned at the time, he used one of the clear plastic fuel filters and a couple small hose clamps ... well he says he remembers just about everyone used those back then, but he was sitting at a traffic light one day and started smelling strong fuel,odors, and smoke started coming out from under the dash and thru the air conditioning ducts, he pulled over to open the hood and found gas spraying in a fine mist from a crack in the hose that had turned yellow and hardened with heat and age in the engine compartment, the smoke was from the fuel mist hitting the hot engine,the crack was where the clamp was on the filter, he had no idea why the engine failed to catch fire. but he replaced the hose and filter , and when he got home he called a friend that he knew was using a similar set-up, the friend said he had already replaced his fuel line after having a small fire when he moved the cars air cleaner and busted the hose! hey grumpy? 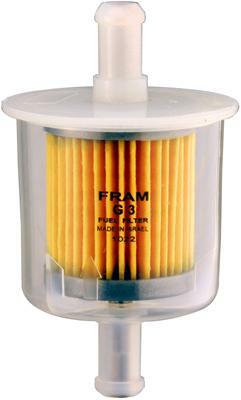 I have a couple old fuel lines that have started to leak and I can,t get the lines with the prefabricated ends from G.M. as they are listed as discontinued. Thats hardly a rare situation on older cars, if you have the old fuel lines, or or the old fittings on those old fuel lines or can find those fittings in a local salvage yard, you can bring the exact fittings and measurements or in a best, case, the old fuel line assembly with the ends still attached ,too any good local hydraulic hose supply, store and they can fabricate you new ones fast and easily, if you can,t get matching fittings, you can usually get either adapters or swap the matching fittings to match both sides of a connection. 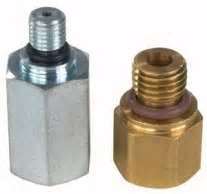 you can also get most fittings or adapters as manufactured tend to use whats available and fairly cheap. now you might need to search a bit but you can usually find the matching hose fittings or have both sides of a connection point converted to a match set. yes I also think that the use of the ETHANOL protective fuel additives is a smart move, when dealing with the current pump octane gas laced with ethanol thats so damn destructive, when used in smaller engines or older car engines that were never designed to use it, or cars that get limited use, that sit with old fuel for weeks, between use.